Was your ancestor an orphan train rider? Ready to find your little wanderer? and have a brush with the law? The New York Juvenile Asylum (NYJA) was founded in 1851 by a group of prominent businessmen and professionals concerned about vagrancy among poor children in New York City. The Asylum was designed to house, educate, reform, and indenture children who were homeless, truant, and criminal (convicted of petty crimes) in New York City. The founders conceived of the Asylum as a place for non-delinquent children – an alternative to the punitive House of Refuge for the more hardened young criminals who were incarcerated alongside much older adults who were convicted of very serious crimes. As a general rule, children accepted into the NYJA were generally between the ages of seven and fifteen, but children both younger and older were also accepted at times. The New York Juvenile Asylum building in Washington Heights on 176th Street between Tenth and Eleventh Avenues. Note the wing barely visible in the back. There were many reasons a child might be committed to the asylum. In addition to the reasons listed above, others were removed from homes that were deemed unfit, and a great many were surrendered by destitute parents or relatives (if the parents were incapacitated from liquor or drugs, or were deceased), and parents who just plain grew tired of dealing with an incorrigible child. This latter reason was given for the commitment of Mr. Kidder’s great-uncles, Clarence and Lewis Reese, who resided with their parents in Brooklyn, New York. Their admittance to the NYJA took place in the 1880’s. Regardless of the reason for commitment, all children were processed through the Asylum’s House of Reception where they were assigned a case number. After a period of from ten days to several weeks of assessment (which included determining what their education level was, etc.) those children deemed proper candidates (i. e. those not found to be too incorrigible or whose parents could not be located, etc.) were sent to the Asylum proper. At the Asylum children received six hours of schooling a day, as well as moral, religious, and vocational training. The in-house schooling was divided into two sections, alternating between academic studies and the “workshop.” Worshop services were conducted twice a day, morning and evening. 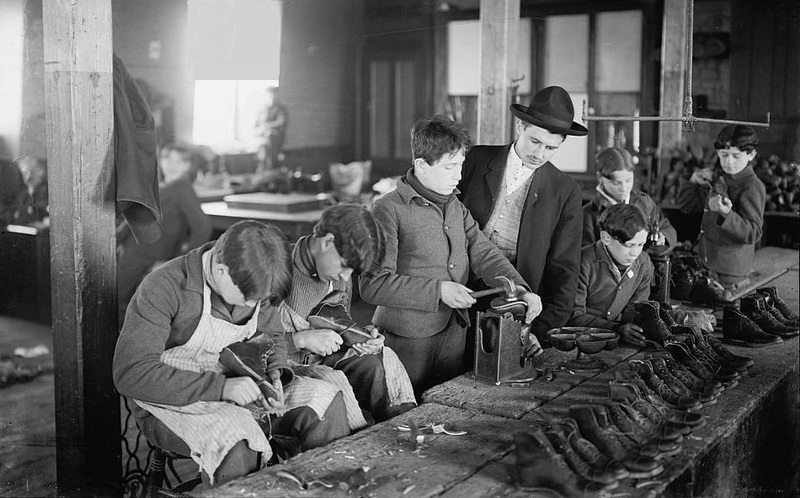 Boys who learned to make shoes worked four hours every day, five days a week. The shoes were sold at a profit of $6.00 per case, earning the Asylum between $4.00 and $6.00 a day, “whilst the children enjoy the instruction and supervision of a competent and trustworthy overseer.” Girls made up the smaller part of the population of children at the asylum. They too, received training, “They are drilled into thoroughness in all that they undertake; and, instead of growing up to be drones and beggars, fitted for a career of degrading vice and for an early grave, they now bid fair to be industrious, useful, and virtuous members of society.” The girls were taught to “read, write and cipher,” as well as to sew. The girls’ needlework was subsequently exhibited and sold at a fair in the Fall. NEW YORK JUVENILE ASYLUM (1851), 176TH St. and 10th Ave. Office and House of Reception, 61 West 13th St. Is a reformatory for truant and disobedient children of both sexes, residents of the city, between the ages of 7 and 14 years, committed by a magistrate or surrendered by parents or guardians. It also provides homes in the country for friendless or surrendered children. Accommodates 800 at Asylum and 100 at House of Reception. Apply at the House of Reception at any hour of the day. Not all children at the NYJA were truly orphans, and many were released to parents or family members after periods of financial difficulty had passed, or when officials at the NYJA decided the child had been reformed to their satisfaction. Few records exist for these children after they were reunited with families. At the dawn of the twentieth century, as new concepts about social work spread though the United States, the building in Washington Heights began to feel outdated. In 1901, after lengthy deliberation and in the face of rising property values, the Asylum’s Washington Heights site was sold and 277 acres of farm land were purchased in Dobbs Ferry, New York, in Westchester County – twenty miles north of Manhattan. The trustees of the NYJA held an architectural design competition for a suburban facility. The winning design featured a cluster of residential cottages that would become unofficially called “Children’s Village.” A Gold Medal awarded the Asylum by the St. Louis Exposition for plans of new school and exhibit of handicraft and class-room work. The new grounds were ready to be occupied by 1905 and the mass exodus of children from Manhattan began. There was one catch. 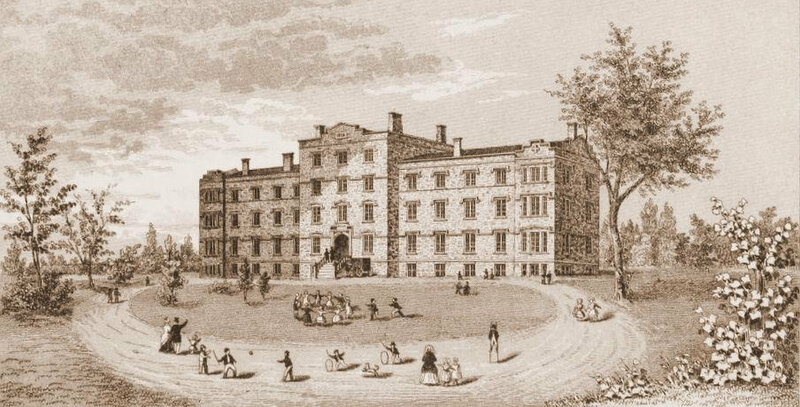 The new facility had space for less than a third of the youth who had lived in the Manhattan asylum, which necessitated the discharge of some students, and the transfer of most to other institutions in and around Manhattan. Those not sent to the new facility in Dobbs Ferry included females, African-American, Jewish, and Catholic children. The new “Children’s Village” in Dobb’s Ferry, Westchester County, New York. In 1920, during a reorganization that promoted a more therapeutic model of care which was then in vogue, the institution’s name was officially changed to “Children’s Village.” Children did not stay at the facility indefinitely; after 6–12 months (as a rule) they were returned to their families or placed in foster care. Children’s Village still operates to this day as a treatment center and residential facility for boys in Dobbs Ferry, New York. The total number of children admitted to the NYJA from its inception up to December 31st, 1919 – no less than 42,977. An estimated 6,000 children were sent West from the NYJA between September 1854 and circa 1923, placing it in the top four (for the number of children sent) of those institutions credited for taking part in America’s Orphan Train Movement. 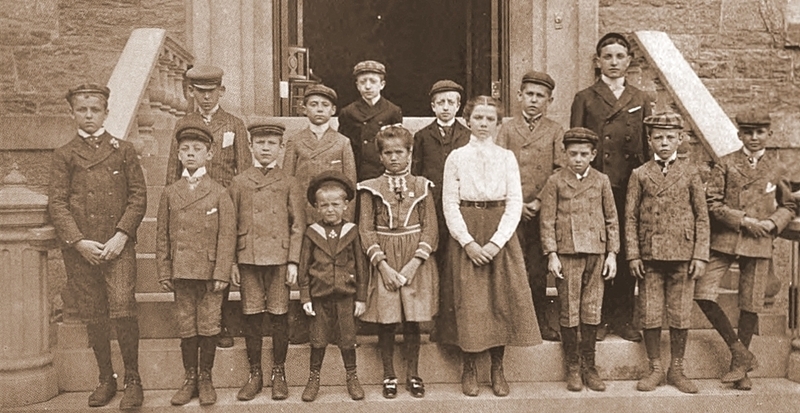 Their first participation in what is now referred to as America’s Orphan Train Movement was in a somewhat indirect way and involved supplying the majority of children for the very first company of children sent West by the New York Children’s Aid Society. Before embarking for Dowagiac, Michigan in September 1854, the Children’s Aid Society visited the NYJA and picked up about thirty children for what was then a new experimental program begun by Charles Loring Brace, the Society’s founder. It was known as “placing-out” and would be a function of the Children’s Aid Society’s Emigration Department. While perusing the early records of the NYJA, Mr. Kidder came across all the names and ages of the children sent West from the NYJA on that very first orphan train. He presented the list to the Dowagiac History Museum in 2017 during their Orphan Train Riders Descendants’ Reunion. The following year (1855), the NYJA was approached by a minister named Rev. Mr. Enoch Kingsbury – a child saver of sorts who hailed from Danville, Vermillion County, Illinois. Kingsbury had recently established an association in Vermillion County for the purpose of bringing homeless and destitute children from New York City to Danville and other locations in Illinois and western Indiana to find homes for them. The NYJA consented and subsequently supplied several hundred of their children to Kingsbury to be indentured. The majority were placed with farmers, but city homes were found for them as well. Just two months after Kingsbury took his first company of children West, the NYJA sent a company to Andover, Ashtabula County, Ohio. It is not known why they were sent to that particular location or who took the children, but it may have been the Children’s Aid Society. A large orphanage was in operation in the city and may have been involved in some way. No subsequent companies of children were sent to Andover. Within a few months the NYJA began sending companies of children to Maryland and would send three fairly large companies of children to that state by the end of 1855. The NYJA ended their agreement with Reverend Mr. Kingsbury in 1857, but decided to begin sending children to Illinois themselves, retaining Kingsbury as one of their County Agents – a position he held until the 1860’s. They modeled their plan after Kingsbury’s, which required the person taking a child (the “employer”) to sign an indenture agreement. In the agreement the employer had to promise to send the child to school at least during the winter months, clothe them properly, and send them to church and Sunday School. At the end of the indenture (age twenty-one for boys and eighteen for girls), the boys were to receive $100.00 and a new suit of clothes. The girls were to receive $75.00. For the next forty-one years the NYJA sent thousands of children almost exclusively to the state of Illinois for indenture. In 1861, under a special act of the Illinois legislature, the indentures of the Juvenile Asylum, including the rights and duties both of the employers and their wards, were carefully defined by law. The act was sponsored by two legislators who themselves had taken in children from the Asylum. Beginning in the Autumn of 1898 the NYJA decided to begin indenturing children to parties in Iowa as well. Besides Iowa, occasional placements were made in several other states adjacent to Illinois, namely Missouri, Wisconsin, and Indiana. The NYJA established a Western Agency in Chicago (moved to Normal, Illinois after the Great Chicago Fire, then to Englewood years later), and employed an Western Agent to oversee the placement and follow-up visits of children. In addition, County Agents were also secured to help the Western Agent with finding homes and various other duties, such as replacing a child if the home or child was deemed unsatisfactory. The Asylum kept track of the children via this Western Agency until their indentures expired, sometimes corresponding with orphans and the families with which they were placed for many years thereafter – reporting their marriages, births of children, and vocational accomplishments. These case records provide abundant information about the experience of “orphan train” children apprenticed to Western states. The NYJA also selected letters from the children and their employers for the Asylum’s annual report, which provide a glimpse into the day-to-day life of the children and interactions with their employer. For the first twenty years of the annual reports, only the initials of the children, their foster parents, and the initials of the city, county, and state they lived in were used. Through careful comparison with the original records of the NYJA Mr. Kidder has managed to identify the vast majority of the children and foster parents associated with the letters. Beginning in about 1907, Charles L. Brace, Jr., Secretary of the New York Children’s Aid Society (based in Manhattan), re-established a loose partnership with the NYJA, and also approached the New York House of Refuge, for the purpose of taking a number of their male inmates (particularly those identified as good candidates for placement in Western homes) to the Brace Farm School in Valhalla, New York, and training them to be little farmers. Once trained they were placed on what we now refer to as orphan trains and sent West under the auspices of the Children’s Aid Society. Brace continued this arrangement with the NYJA until at least 1920 and perhaps a bit later. Rochelle Gridley’s Orphan Trains of Illinois is an excellent resource for information on orphan trains sent to Illinois and has an interactive map. The National Orphan Train Complex in Concordia, Kansas collects and preserves information on all known orphan train riders in the United States.